Born in Ishikawa-ken. 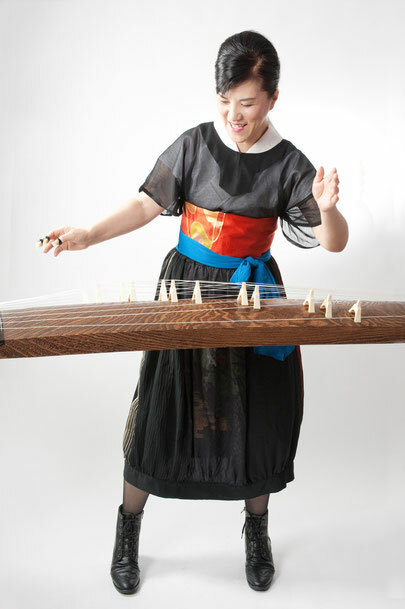 Studied koto under maestros Tadao Sawai, Kazue Sawai　and Takeshi Nakai. instruments at Tokyo National University of Fine Arts and Music. concerts in Vienna, Moscow and Ukraine (1991); Moers Jazz Festival, Germany (1992); Latvia and Estonia (1992); Paris (1993). (with the Scottish National Orchestra) and The Free Trade Hall (Manchester). Yoshihide Otomo, Kevin Volans and Elliott Sharp. Collaborated with Phil Minton (voice) at Tokyo Museum of Modern Art (MOMA). Foundation Centre and many others. Toured in Thailand, supported by the Japan Foundation. masterpieces", produced by Morgan Fisher. Recorded and compiled a CD containing playing methods for the koto. Was a guest for Ondekoza’s live gig. Jul. Together with Ohtaka Shizzle, Yamaguchi Tomo, Isso Yukihiro,[ET’S UNIT] had a lobby concert at Asahi Beer’s Moji factory. Organized by the Asahi Art Festival 2004.
at the Japanese Composers Assembly Concert (at Sumida Triphony Hall). Feb. Part of Mizoiri Keizo’s CD entitled “Neko Ni Kohan”, as Shamisen and vocal. Apr. A member of KOTO VORTEX, Performance of Terry Riley’s composition “In C” at Carnegie Hall. Musician Produced by Kronos Quartet. and Senzoku Music Junior College in Uozu(1990). 1987 Part of the “Tadao Sawai Ensemble CD(Koto)(Columbia) which won the Japanese Agency for Cultural Affair’s Work of Art Award.